WORKING OUT: The number of overseas contract workers from Nepal going to Malaysia has declined dramatically in the past year. Till recently Air Asia flights between Kuala Lumpur and Kathmandu would be full of Nepali migrant workers flying out to jobs in Malaysia, or returning home. But in recent months, while flights out are mostly empty, those to Kathmandu are full. Nepali workers in Malaysia are returning home for good, and there aren’t too many to take their place. After the earthquake in Nepal last year, experts had predicted a surge in workers migrating overseas for work. But the opposite seems to be happening. A lot fewer Nepalis are leaving, and the most drastic drop has been in workers going to Malaysia. Figures from the Department of Foreign Employment (DoFE) show (see Fig 1) that only 312,000 Nepali workers left for work abroad in the last nine months, whereas 513,000 left in the same period last year – a whopping 40 per cent decline. The reason for the drop to the Gulf appears to be the Nepal government’s inability to negotiate better terms for its workers. In Malaysia it is an inhospitable working environment, the falling Ringgit and a moratorium on foreign workers. The falling numbers will shrink remittances and raise the unemployment rate in Nepal itself. About 18 per cent of Nepal’s population works in India, Malaysia, and the Gulf countries, and they send home more than $6 billion annually – making up nearly a quarter of the country’s GDP. 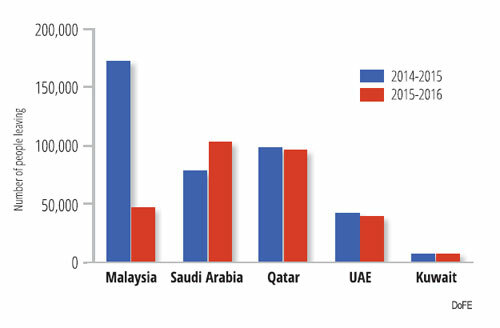 Malaysia and the Gulf countries: Saudi Arabia, Qatar and UAE have been the most popular destinations for Nepalis seeking jobs. At the time of the earthquake, 1,500 Nepalis were leaving for overseas employment each day. That figure has come down by 40 per cent today. One of the reasons is the shortage of construction workers after the earthquake has raised salaries in Nepal itself, so prospective migrant workers are finding it worthwhile to stay and work in Nepal. The other reason is that the government’s effort to enforce a free visa and ticket provision for its migrant workers has met with stiff resistance from recruitment agencies, and led to a sharp drop in outbound workers. Kumud Khanal, Vice-president of Nepal Association of Foreign Employment Agencies (NAFEA) disagrees that the decline is because domestic salaries have risen, but because of the Nepal government’s new regulation banning recruitment agencies from charging workers for visas and tickets. Janak Regmi, spokesman of the DoFE says that the earthquake should have increased the number of people leaving, but says the reason for the decline is that the government is stricter in enforcing new regulations. There was hope that post-earthquake reconstruction would lead to a demand for workers, but even a year later rebuilding is slow (see Fig 2) to pick up due to the Indian blockade, apathy of political leaders and government indecisiveness. A Post-Disaster Needs Assessment last year estimated 700,000 workers would be needed for reconstruction. Only 30,000 of the total houses destroyed have so far been rebuilt. Nepal needs its workers at home (see Fig 3). Over the course of 12 months, right after the Nepal earthquake, there has been a dramatic decline in number of Nepalis going to Malaysia for employment (see Fig 4 and 5). Khanal of NAFEA lists several reasons for this. "The Nepal government is not lobbying hard enough to promote our workers and there is competition from Bangladesh. The free visa and ticket requirement have made Nepali workers less competitive, and there is the fall of the Malaysian Ringgit,” he said. Additionally, the Malaysian government in late February announced that it wouldn’t be recruiting any foreign labour, but on Wednesday lifted the ban. The drop in traffic to Malaysia has meant an increase in the number moving to the Gulf, mainly Saudi Arabia. A total of 102,728 people left for the Gulf nation in the last fiscal year 2015-2016, compared to 78,400 a year before. The decline in number of people leaving for overseas migration and especially Malaysia will increase joblessness at home since the Nepal government has no systematic plan to employ young workers at home for earthquake reconstruction. Many Nepali workers interviewed in Malaysia said they would gladly stay home in Nepal if the government could guarantee them jobs with a minimum salary. The Nepali Congress has all along exhibited its well-known knack for extracting defeat from the jaws of victory.